Challs International Ltd, the company behind the Buster Plughole Care range, has launched two new innovative products into their existing Bin Buddy range. Building on the successful launch of Bin Buddy Citrus and Berry Blast, which hit the market in 2010, Bin Buddy Kitchen Bin Freshener and Bin Buddy Indoor and Outdoor Bin Disinfectant Spray have been designed to offer consumers an easy and affordable solution to smelly, germ infested indoor and outdoor bins. 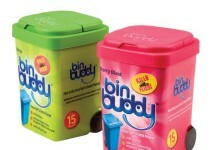 Sales director Kieran MacSweeney says: ‘When we launched Bin Buddy we were creating a new category of ‘bin care’. This followed extensive research carried out for us by OnePoll prior to launch, which highlighted the mass of consumer demand for products that tackled bin odour and insects. 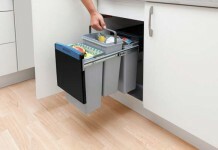 Each pedal bin-inspired Bin Buddy Kitchen Bin Fresher contains 18 applications of citrus scented powder, to be sprinkled in or on top of binliners after each use. The powder neutralises bad smells and also effectively kills germs. The versatile Bin Buddy Indoor and Outdoor Bin Disinfectant Spray can be used to cleanse, deodorise and disinfect indoor and outdoor bins. Simply spray, leave for 20 seconds and wipe with a clean cloth or paper towel. The spray is ideal for removing food spills around the lid and surrounding areas, leaving behind a fresh citrus scent. The entire Bin Buddy range is being supported by a national TV advertising campaign airing throughout July and September during Daybreak. 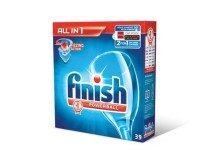 Bin Buddy Kitchen Freshener (Recommended Retail Price (RRP): £2.49.